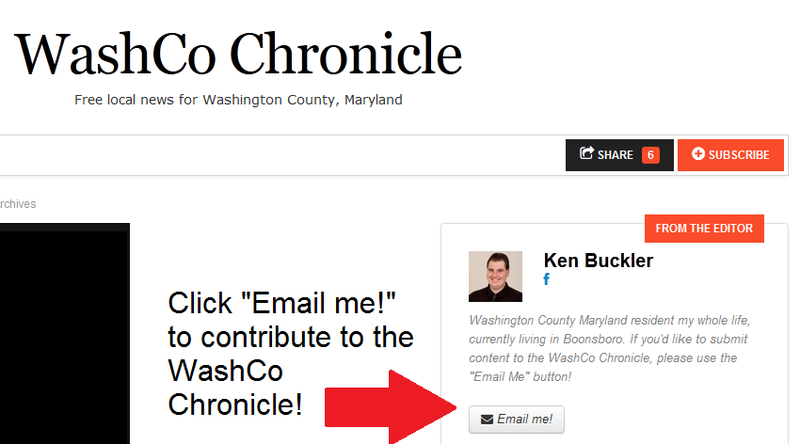 Boonsboro, MD - The WashCo Chronicle is seeking volunteer contributions for commentary on local area political issues and candidates. Anyone can submit, including political candidates and elected officials, regardless of issue stance or political affiliation. This is your chance for your voice to be heard, and be part of this exciting new effort to bring free news to the Washington County area. Best of all, your opinions will never be hidden behind a paywall or page view limit. "Western Maryland: A New State Initiative"
To contribute, simply click the "Email me!" button on the WashCo Chronicle homepage. Please include your full name and city/state of residence. Please note that the editor reserves the right to edit your submissions for grammar, spelling, and to remove offensive content. The editor also reserves the right to not publish your submissions. Your submissions remain your intellectual property, and will be considered "licensed" royalty free for permanent one-time publication on WashCo Chronicle Page TWO. Boonsboro, MD - An independent effort to bring free news to Washington County, MD area residents was kicked off today. The Washington County Chronicle is an independent news aggregator, providing free news for the Washington County area. In addition, the WashCo Chronicle will provide independent editorials and opinion pieces. The site will be completely ad supported, with no subscription fees or paywalls. Washington County, MD residents interested in an alternative news source to current "local" news sites with paywalls and subscription fees are encouraged to visit the main website and subscribe for daily email delivery!